The deep sea angler fish lives in deep, dark waters. How does it find food and attract a mate in the dark? Deep sea anglerfish can swallow prey twice their size. 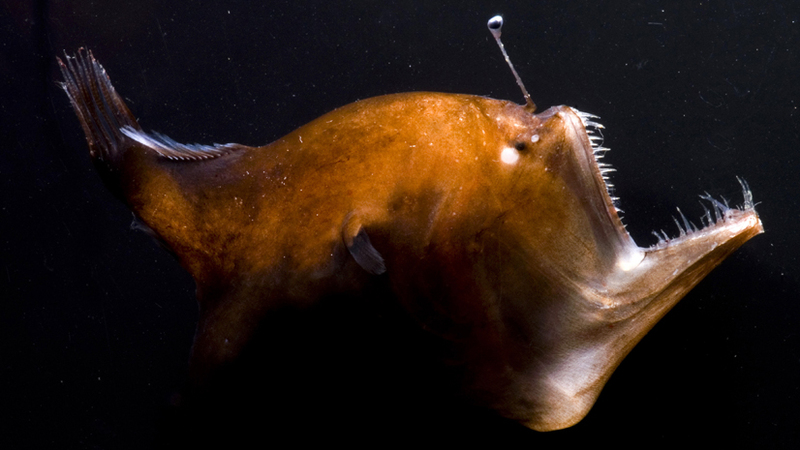 Female anglerfish have protruding glowing rods to entice their prey. The male anglerfish is responsible only for finding a mate - he does so by detecting a chemical the female emits. Once the male anglerfish finds a mate, he fuses with her body, providing her with sperm and living off her blood supply. Deep sea angler fish have large mouths, sharp teeth, and can swallow prey up to twice their size. They get their name from the glowing rods that protrude from their bodies, used to entice prey. Only female angler fish have lures.